Samsung Galaxy S phones have a long history of GPS problems. Other Android phones do too, but Samsung phones running Android 2.1 are a mess. Supposedly, there is a fix in Froyo which will resolve this GPS issue … and should Samsung ever decide to update their existing phones … Anyway, there is still something that you can do. Download GPS Status & Toolbox by EclipSim from the Android Market. 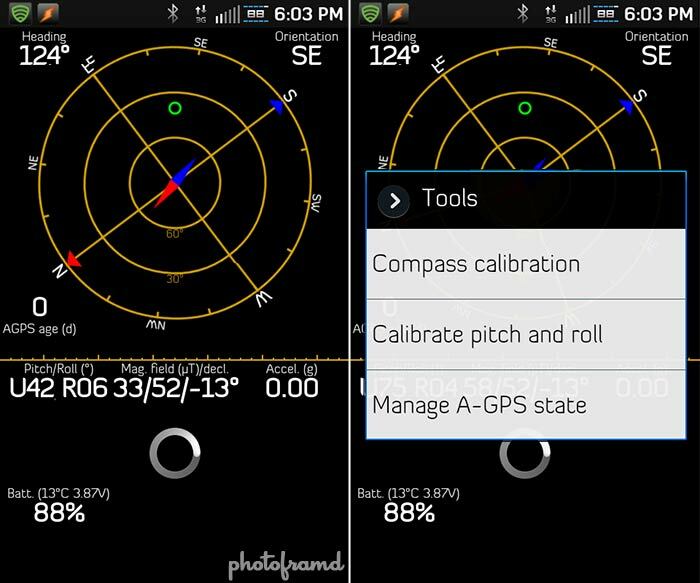 Hidden in the tools of this App is the ability to directly update your A-GPS State. This tool was primarily created to check the state of your phone and GPS. If your phone’s GPS is behaving erratically there is an option in Tools | Manage A-GPS state which allows you to reset the GPS. This action will delete all received and cached data. (Please note that even a phone restart and battery removal cannot reset your GPS correctly because the data is stored persistently inside the GPS chip.) Android phones can get assistance data from the internet containing the orbital data of the satellites. You can initiate a download also on this dialog. The downloaded data is valid for 4-5 days and will give you a much faster GPS fix. After clicking Tools > Manage A-GPS State, you will see the above dialog box. Just click Reset to clear all cached GPS data and then Download the latest data. But, you can even take this a step further. Under Settings > GPS & Sensors > Auto-download AGPS data you can select to automatically download the latest data when this App is run. If you have a program like Tasker, you can have GPS Status run every morning at 6AM to almost guarantee having an accurate GPS all day. Pretty cool! UPDATE 11/15/2011 – Gingerbread fixes most GPS issues! I have been running the stock EI22 Gingerbread for my Samsung Epic 4G for almost 2-weeks. It’s like having a new phone! One of my biggest headaches was the GPS under Froyo. Gingerbread updates the GPS files as well as the modem which drastically improves the GPS response and accuracy. If you have not updated to EI22, you should. Keep in mind that it will completely wipe your phone’s internal files (the SD card is not touched). Take a look at my update on To Root or Not to Root for info on manually updating to Gingerbread. If you do not want to jump to the full Gingerbread release, you can also try updating the GPS with the daemon files from an earlier Gingerbread leak (not final, but close). These files are flashable through Clockwork Mod. Before I installed the full Gingerbread release, I tried this updated and the GPS performance improvement was incredible! There are many Samsung Galaxy S users with a GPS so horrible, that some of them might chuck their handsets out of the window for their Google Maps giving up on them altogether. Well, in case you are getting any such ideas, then think again, because our friend Saad at Wccftech is out with a fix for Galaxy S’s GPS issue. In order to fix the GPS issue on this handset, you don’t need to have root. Here are the step by step instruction of solving GPS no-fix problem on Samsung Galaxy S.
*#*#1472365#*#* If you are running Android 2.1 Eclair. *#*#3214789650#*#* If you have updated to Android 2.2 Froyo. once you finish dialing the codes mentioned above, you will have a LbsTestMode screen on your phone with several option. Now tap on Application Setting. In Application Settings, click on Operations Mode followed by selecting Standalone. Once you are back on Application Settings, tap on Start Mode and click Hot Start on the pop-up. Now select GPS Plus and put it on by clicking the ON radio button. Once done, click on SkyHook and also change it’s value to ON. Now go back to the first screen and tap on SUPL / CP Settings. Once you have done this, tap on Server FQDN Type followed by clicking on AUTO Config. Once you are through all this hardwork, it’s time to reboot your handset. Once your Galaxy S boots, launch Google Maps and you will get the fix within 5 to 10 seconds. Enjoy GPSing! Refer addictivetips.com for details to fix gps issue on other phones. Sorry, but this fix does not work for the Samsung Epic 4G. Neither number accesses the LbsTestMode. Thanks. It works for me. I was having the same problem. I asked the XDA Developers board for the Epic 4G, and they said that the dial codes will only work if you have a stock dialer. If you have a custom ROM with a custom dialer (or an alternate dialer like aTAKEphone), the dial codes will not work. I think this fix worked! Thank you so much! I’m new to geocaching, and my cGEO map tracker app was frustratingly inaccurate. I followed your directions and the GPS reset itself properly. Now I can geocache with a lot more confidence! Glad it helped! I use GPS Status everytime the GPS seems slow or unresponsive. Just go into the Tools > Manage A-GPS state and press the Reset button. You can also force a Download of the latest GPS assistance data in this same location. I had no problems at all with my sgs fixing until last month when it decided to stop working. I didn’t do anything, no updates (I’ve got gingerbread 2.3.3), no downloads, no changes in settings…. nothing at all! Is there anyone who can help me or give me any suggestion? Did you update your phone for your region? I’m in the US and use Sprint. If I installed a Gingerbread update for another region, it would cause all sorts of problems. Did you try rebooting your phone? A reboot can clear-up a lot if GPS issues. Did you try GPS Status, as mentioned in the article? GPS Status works even better with Gingerbread. Just go to Tools > Manage A-GPS state > Reset. Lastly, be sure to check the XDA Fourm for your SPECIFIC phone on additional tips and fixes. Hi Photoframnd and thanks for your suggestions! Yes I’ve reboot my phone many times but with no results at all.. Yes I’ve rest many times my gps data, with different programs, but it still doesn’t work. do you think that I could find a solution by bringing my phone to Samsung assistance? I am guessing that you are in Italy. Who is you cell phone provider? Samsung would have a Gingerbread update that is specific for your cell phone provider. It is important that you updated with THAT version and not an update for a different provider. There are geographic limitations for each provider, roaming network and GSM/CDMA differences. As long as you updated your phone from the “official” release for your provider, you should be fine. Did you also update your modem to Gingerbread as well? The GPS is controlled by the modem. The Gingerbread modem contained speed improvements and bug fixes. It’s like having a new phone! hii guys i am having samsung galaxy s plus having android version 2.3.4. For me gps was working perfectly, recently i updated the google maps and now the NAVIGATION has stopped working. Even though i am driving on the road it doesn’t get updated at all. Any idea how to fix the problem ?? The first generation Galaxy had a buggy GPS. It was a carry-over form the previous generation Samsung phones. GPS worked sometimes, but it was very slow to wake-up. 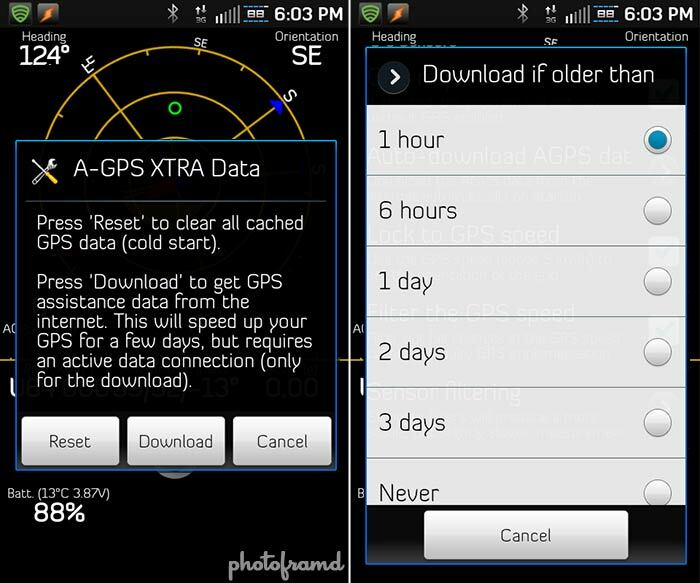 Using GPS Status to download A-GPS Xtra Data will greatly help. Also try keeping your WIFI on. Android will use the WIFI network as an interim calibration until the GPS is fully awake. The good news – the Samsung Galaxy S3 and Note 2 do not suffer from a slow GPS. Good luck.